LEAVES! LEAVES! AND MORE LEAVES! My Solstice gift from Mother Earth is a bounty of leaves for whatever I may choose to use them. 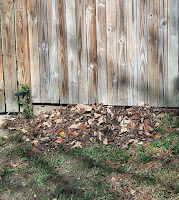 I've been raking and piling this morning. I wish I had a wagon so I could haul more from all over the complex, but I believe this huge Chinquapin oak is going to give me all that I can use this year. The maintenance men are raking them off the roofs in huge piles, but I have no way to haul them way over here from the other end of the complex. Next year, I'm definitely buying a wagon for when the oak leaves fall but for now, I'll have to be happy with what I can get around the apartment, which is no small bounty. I had a large elm tree next door drop half its leaves on my side of the fence, and the Chiquapin has barely started dropping its leaves. If I don't act fast, the yard crew will come mow and blow them away, so I have to get them whole. It would be nice if I could just get them to chop the leaves up and leave them. 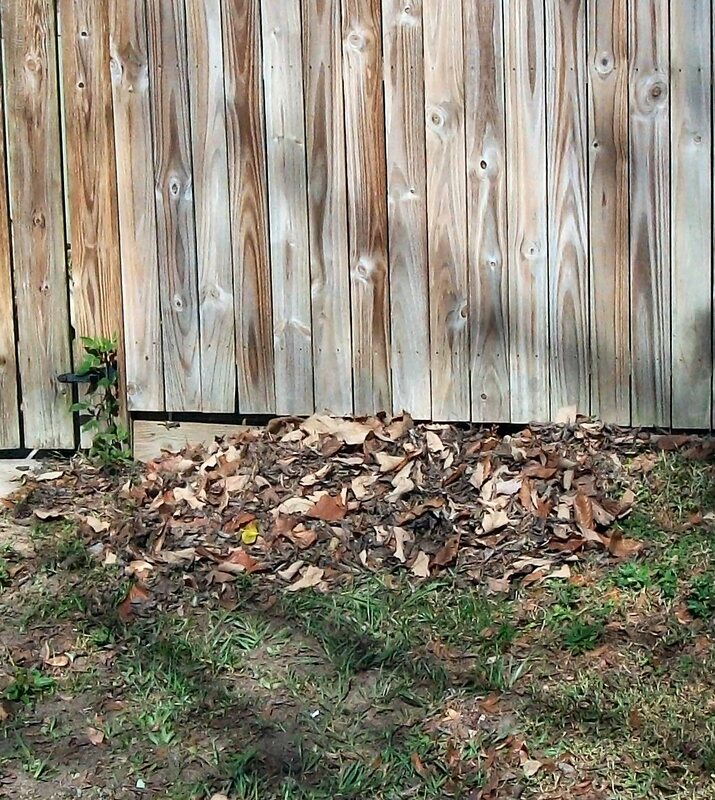 I started a small leaf pile outside my neighbor's fence. He's into gardening too, so he doesn't mind. I'm planning on getting some pallets and making that into a compost pile next year. 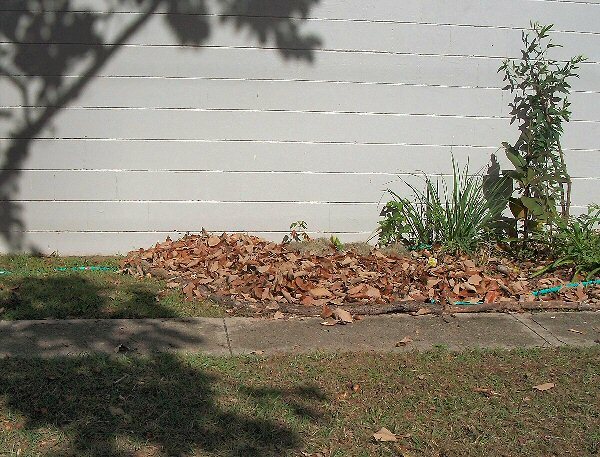 I added 3 more feet to the outside garden by covering it with leaves to kill the grass. I have to go find some fallen limbs over by the pond to line the walkways to keep the leaves in so they can be dug in next spring. I'll eventually get some more concrete edgers to go all along that side, but the fallen limbs are working well for now. By the way, that tall plant on the right of the picture is my pigeon pea. I had to stake it, but it's really growing well, and I hope it blooms soon and I get some peas this year. Added more leaves to what will soon be the Brugmansia bed. I'm really looking forward to having those! This is the perfect place for them, with some morning sun and shaded from about 10 a.m. on. Will go haul some moss in a bit. 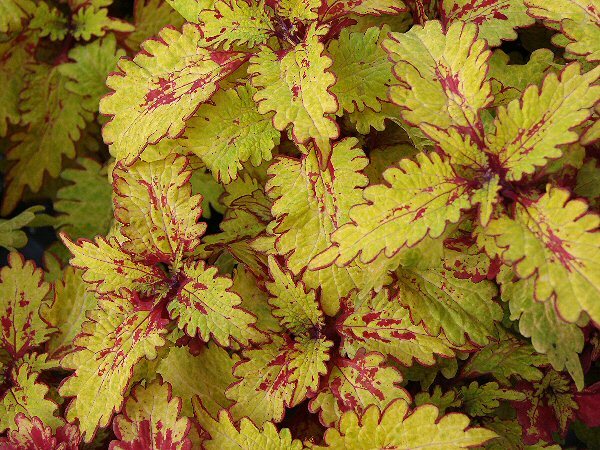 It's lighter and easier to carry and is an excellent mulch. I pile it up then cover it with the large (free) pine bark for looks on the outside. I hope they order more of the pine bark because the pile is gettting pretty small. I'm hauling as much as I can now before it's all gone. And then there is that huge bare area over by the oak tree, where I'm planning on putting a Loquat and probably a Chicasaw plum as well. That's a project for the future, though. I don't want to do too much and create a monster I can't take care of. Anyway, I have a plan that includes planting as many edible ornamentals as possible, or at least things that the neighbors won't recognize as food and steal. The rest will go inside the courtyard or as much as I can. I hope everyone has a very Happy New Year! Let me know what your garden plans are for 2016 in the comments, or in reply to this post on our Simply Deb Facebook page.